This stunning itinerary takes in four countries in what is sure to be the journey of a lifetime. Whilst staying in luxury accommodation, you’ll get the chance to see the highlights of Thailand, Laos, Vietnam and Cambodia. Exploring culture, cuisine, religion and nightlife, this trip will educate and inspire you in equal measure. They say that one night in Bangkok and the world’s your oyster. Well, in that case, you better make the most of it. The stuff of legend, both songs and films have been dedicated to a night spent in Bangkok. A city of infinite possibility, on this night tour we will guide you through a few of the highlights. Begin your evening at the super-chic Long Table Bar, where you will enjoy sunset cocktails and views over the central part of the city. From here we will move on to one of Bangkok’s best kept culinary secrets – a local street food eatery where the smells, sights and taste of the city abound. To cap the day off, catch the BTS skytrain to the Chao Phraya River before boarding a boat to the latest night market, ‘Asiatique’. Here, you can shop and watch local entertainment by the river. Enjoy cocktails on the rooftop bar at the Banyan Tree. Fly to Luang Prabang. Visit one of Laos’ most picturesque temples, Wat Xieng Thong. Located at the end of the peninsula close to the Mekong River, this temple was erected in 1560 by King Setthathirat and is deeply revered by the Lao people. Walk to the boat pier near the temple to board the Nava Mekong, a beautiful wooden riverboat for a cruise up the Mekong to the Pak Ou Caves. The journey takes around 2 hours; as you sail you will be surrounded by spectacular views. Upon reaching Pak Ou, disembark to explore the caves. Here you will see thousands of gold lacquered Buddha statues crammed into two caves carved out of a towering limestone cliff. The statues range in size from a few centimetres to the size of a human, and the view from the mouth of the cave provides sweeping views of the Mekong and Nam Ou rivers. The caves are as well a destination for local pilgrimages, especially during the Lao New Year period of Pii Mai. Fly to Vientiane, where you’ll set off to enjoy a guided tour and discover the hidden charms of the city, whose name means ‘the city of sandalwood’. Vientiane is one of the quietest capitals in the world, far away from the bustle and hustle of other Asian capitals and far from the real-estate frenzy of the regional megalopolis. Continue on to the nearby Wat Phra Keo. Used as a religious museum, Wat Phra Keo displays a collection of both Lao and Khmer works of art. Nearby is the Presidential Palace. Although you are not allowed to go inside, you’ll get a good glimpse into the town’s colonial past as this building formerly served as the French governor’s palace. Then, continue your tour with a visit to the Patuxay monument, Laos’ version of the Arc de Triomphe, where you can climb the stairs to the roof for sweeping panoramic views of the city. Next, your tour takes you to That Luang, the holiest site in Laos. Constructed by King Setthethirat in the 16th century, the temple is resplendent as the sun shines upon its towering golden spire. Fly to Hanoi in Vietnam. Head to the Temple of Literature. In 1076 Quoc Tu Giam – Vietnam’s first university, also referred to as Van Mieu, was established within a temple to educate Vietnam’s royalty, mandarins and members of the elite. The university functioned for an incredible 700 years and its gardens and well-preserved architecture offer a fascinating glimpse into Vietnam’s past. The One Pillar Pagoda, founded by King Ly Thai To in 1049 will be visited next. This structure is one of Vietnam’s most iconic temples. Close by is the mausoleum of the historic figure and father of modern Vietnam, Ho Chi Minh. The former president’s house on stilts where he lived from 1958 to 1969, his former home illustrates the modesty of this Vietnamese revolutionary. Continue to picturesque West Lake and the sixth century Tran Quoc Buddhist Pagoda. Fly to Danang. Hoi An is a destination with two faces – the charming, old-world trading port of narrow streets and traditional houses, and the beach with its new resorts and long stretches of clean white sand. In keeping with Hoi An’s heritage as a trading port, the town’s tiny shop houses a range of craft shops and artisans including some of Asia’s best bespoke tailors. Despite the passing of 200 years and the ravages of weather and war, the centre of Hoi An remains much the same as it was in its heyday. Take a walking tour of the ancient town centre to visit former merchants’ houses, the 400-year-old Japanese Covered Bridge, a Chinese communal hall and the colourful market. Hue, the former imperial capital of Vietnam. Mesmerising tombs and mausoleums of the last emperors of Vietnam reveal fascinating insights into the lives of the imperial families and their subjects. The ancient citadel reflects the pomp and ceremony of the dynastic rulers as well as the scars of many years of turmoil, both ancient and modern (the Royal Citadel was badly damaged in the latter stages of the war) but retains a sense of grace and majesty. Drive through Danang before climbing over the Pass of Ocean Clouds and dropping down to the wonderfully photogenic fishing village of Lang Co. The next day, see the tomb of the former emperor Minh Mang which is located in a tranquil setting of gardens and ponds. Finish up the day at the Mausoleum of Tu Duc, built decades before its occupant’s death the tomb was used as a palace retreat before the emperor’s resting place. Fly to Ho Chi Minh City, still called Saigon by the locals. Explore the history of the city. Take a boat trip around the Cai Be floating market. Traders work the river and some have been living on these waters for generations. Produce at the market are hung on a pole in front of boats to attract customers and make it easier for people to see from afar what is on offer. After visiting the market continue to a cottage factory where ‘pop-rice’, rice paper and coconut sweets are made. Return to the boat for the cruise to Dong Hoa Hiep Island, along the way admire the scenery and the daily life of the local villagers. Lunch will be local Mekong style serving specialities of the area. A morning tour of the temples starts at the South Gate of Angkor Thom. Angkor Thom was the last capital of the Khmer empire and its massive 8 metre high walls surround an area filled with temples. Set in the centre of this area is Bayon, whose massive towers are carved with enigmatic faces. Whilst in Siem Reap, you’ll also visit the famous Angkor Wat and explore the intricate carvings and passageways of this 12th-century temple. Built during the reign of King Suryavarman II in the early 12th century, the walls are covered with stone carvings and bas-reliefs depicting Hindu mythology and the wars Suryavarman II fought during his reign. Angkor Wat is well known for having more than 2,000 stunning Apsara dancers decorating the temple. Construction is thought to have taken around thirty years of intensive labour. 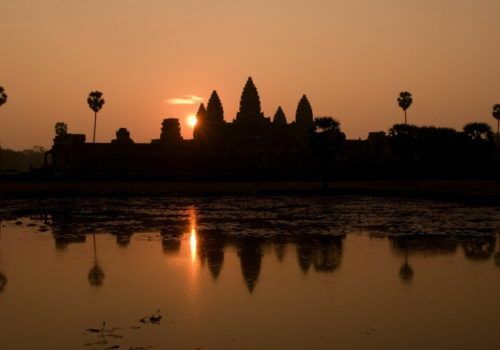 You will be there during sunset when Angkor Wat is quieter and the Apsaras will shine in the most beautiful light.